Sun Dried Tomato Chicken Florentine Pasta: this stuff is OMG good. Today’s post is sponsored by DeLallo! They make the most delicious sun dried tomatoes which you’ll see pictured here 👆swimming in a luscious cream sauce. Don’t mind if they do. I have some truths to tell you today. The first truth is that this pasta rocked our world. Like, five times last week. Okay FINE 700 times or something but I wasn’t even counting and neither should you, so just … yeah. The second truth is that sometimes, when you’re a food blogger and food lover, you want to be creative and fitspo and so you make things like sweet potato noodles with cashew sauce (for the record, also delicious). But then sometimes you still need to make Pasta with a capital P, because under all those fitspo vibes, you’re still mostly a real person who knows in her heart of foodie hearts that real pasta is lyfe. Like this Creamy Sun Dried Tomato Chicken Pasta with Spinach. Am I being basic here? Maybe. And maybe I like everything about this kind of basic deliciousness. This pasta = the moment when everyone in your family falls in love with you for cooking something seemingly-fancy 💅 and reminds you of how good a nice big pot-o-comfort-food pasta really is. No unnecessary ingredients. No excessive toppings – HOLD ME BACK. No veggies masquerading as noodles (of which I am a fan, but STILL just give it a rest already). Just simple, comforting, creamy pasta with sun dried tomato cream sauce that helps people like me win at life. As long as we’re on a roll with the truth telling, the third truth of this post is that one little detail about how I might have picked out the bites of chicken in my bowl of pasta. WHAT IS MY DEAL. I can’t even handle chicken sometimes. I kept the chicken in the written recipe, because a) my family wanted the chicken and your family might, too, and b) the chicken is actually decently good, for chicken, because it gets a little kick of spice from the cayenne, and c) it doesn’t even matter if you make this with chicken or not, because the star of this recipe is so obviously the combo of buttery garlic and spinach and sun dried tomatoes cream sauce on pasta. And when it comes to such luscious, sun-dried-tomato-y things, I be like 👅👅👅. A few things you should know about finding the right sun dried tomatoes for this recipe. Not all sun dried tomatoes are created equally! Don’t buy the sad, dry ones that come in a package – I mean, you can, I’ll still be friends with you, but I’m just telling you – they taste a lot better when packed in high quality olive oil and herbs and spices like the DeLallo tomatoes I’m using in this recipe. If you’re worried about the oil being too oily, no need to fear. We’re draining almost all of it off for this recipe. You just get the little bit of oil that’s clinging to the tomatoes, and instead of dry little shrivels, you get flavorful tomatoes that are moist and chewy and colorful. Oh hey PS. All of DeLallo’s sun dried tomatoes are sulfite-free. Because they rock. Winning. Sun Dried Tomato Chicken Florentine Pasta – a 30 minute recipe with a sun dried tomato cream sauce, chicken, ziti, and Mozzarella cheese. Heat the butter in a skillet over medium high heat. Add the chicken and sprinkle with the seasoning and the cayenne. Saute until the chicken is cooked through. Drain the oil from the sun dried tomatoes. Chop into smaller pieces if you want. Add them to the pan with the garlic and saute for a few minutes, until fragrant. You will probably still get some of the oil from the sun dried tomatoes – that’s okay. Add the half and half, milk, chicken broth, and Mozzarella cheese. Stir until the sauce is smooth and bubbly and the cheese is melted. It should start to thicken up slightly. Stir in the cooked pasta and spinach – the spinach will start to cook down almost immediately. If needed, add extra water or broth or milk to the sauce to thin it out, or add more cheese to thicken slightly. Be sure to stir for a full 4-5 minutes to really thicken. 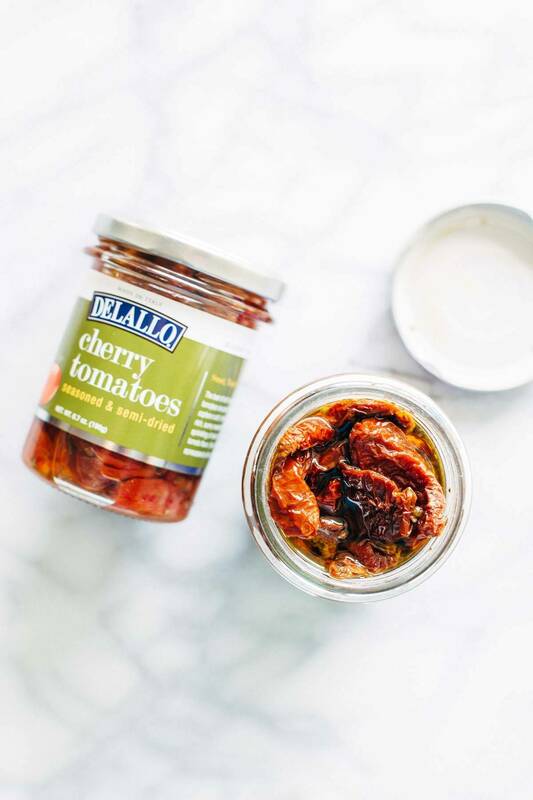 I’ve also used DeLallo’s sun dried tomato bruschetta in this recipe as well as DeLallo’s jarred cherry tomatoes (similar to the sun dried tomatoes but a little more plump and round). CHEESE: Be sure you’re using low moisture part skim mozzarella cheese (we used Kraft brand with a hint of cream cheese!). Do NOT used reduced fat varieties as they will not incorporate well. CREAM: You MUST use full fat half and half – reduced fat or milk will not do the job. STIRRING: Once the cheese is added, be sure to stir for 2-3 minute over medium heat – it will take some time for it to incorporate. Once everything is added in the last step, continue stirring for 4-5 minutes. The key to thickening the sauce is continuous stirring over medium heat. Thank you again to DeLallo for sponsoring this post! And thank you, readers, for supporting the high quality brands that support our little food blog operation. I truly love when you tag me on social media to show me that you’ve found and/or are using DeLallo’s pasta, tomatoes, and sauces in your cooking. Carry on and eat pasta! Yay for Creamy pasta- my favorite! Anything creamy really. The fact that this pasta has cream, garlic, sun-dried tomatoes and spinach – my taste buds are tingling. Pinned! haha love that Dorcas! Hope you like it! Eat all the pasta! This sounds so delicious and hearty. You have to love that creamy sauce! I can’t even resist creamy sauce. I love sun dried tomatoes! They are one of my favorite things to cook with! This looks so comforting and yummy!! Love the sun-dried tomatoes! Thanks Jillian – DeLallo all the way! Those nutrition facts, just wow. Bold move putting it out there, I commend you! I can’t even with all this deliciousness! This is Italian comfort food at it’s finest. Thanks Jessie! Comfort food indeed. Awesome – hope you like it Michele! Sun dried tomatoes chicken Florentine – sounds like a great combination! Pinned to try it! Sun dried tomatoes make everything better! This looks super tasty. I love the juxtaposition of sun dried tomatoes and cream. Have a terrific week! hahaha – right?! we NEED the ones packed in oil! So much tastier. Oh wow, I am absolutely obesessed with sun dried tomatoes, this is one recipe I’ll definitely be trying out. thanks for sharing! Thanks Celyn! Hope you like it! I bet kids would not say no to spinach if they were served spinach in this way! Darn this looks so good! Hope you like it, Shashi! I made this last night. SOOO good! Even my husband, Mr. “I don’t like sundried tomatoes, they are icky” liked it. It came together SO quickly and easily. Thanks, Lindsay! You are so right about the sun-dried tomatoes packed in oil vs. the dry packaged ones. Not even a comparison. I really like the DeLallo brand as well; their products are always high quality. I really like that this is a recipe using sun-dried tomatoes instead of fresh because some people might have a patio tomato plant that is taking it’s darn time producing tomatoes. I don’t know who those people are but they need recipes too. Seriously though my tomatoes have been the same size and color green for like three weeks now. Hi Lindsay, I just wanted to say what a wonderful and versatile recipe this is. 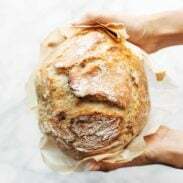 I rarely make recipes more than once but this is such a wonderful cooking technique that lends itself to many types of dishes. Most recently I replaced the spinach with kale and served it tossed with quinoa rather than pasta for a healthy hot dinner. The leftovers I served cold as a salad tossed with just some red wine vinegar. This recipe is a keeper! Thanks a lot for sharing. Great ideas for the leftovers! Yum! Buttery garlic is my love language! Hope you like it, Cathleen! Really really good! I used the 1/2 cup of half and half then subbed (word???) chicken broth for the whole milk. Also used the whole package of brown rice pasta….not as saucy as it would have been with just the recommended 8oz but still totally yummy! Thanks! Glad you liked it, Shelley! Made this tonight and it was fantastic! My three girls all loved it (even the really picky one). I may have seriously considered straight up drinking the sauce, it was that good. Can’t wait for lunch tomorrow so I can have leftovers (may have to fight my teenage daughter for them, though!). Thanks for the awesome recipe, Lindsay, and hope you’re enjoying the best summer ever in MN. Update: Nine year old (the picky one) asked to eat the leftovers for breakfast! Ha! Pasta is my favourite. There’s no need denying it…especially when the English summer reminds you more of autumn..! Great comfort food! Hope you like it, Joanna! Thank you for the fab recipe, so simple but so tasty! This will definitely become one of my go to meals. Looks so good! I love any pasta meal idea and will try this one soon! Hope you enjoy it, Jennie! Just wondering. What kind of mozzarella cheese? The fresh mozzarella or the part skim stuff that you can grate like pizza mozzarella?? I’m doing a little shimmy for this florentine!! Woot woot! !